We love blood bikers – those impressive motorcyclists who deliver blood and urgent supplies between hospitals, whatever the weather throws at their visors. 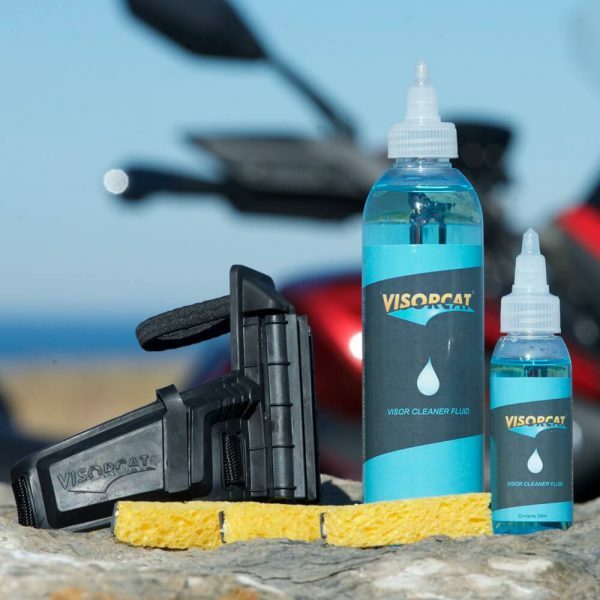 And blood bikers love Visorcat, because it allows them to wash as well as wipe the visor while they ride, providing clear vision in all conditions, all seasons. 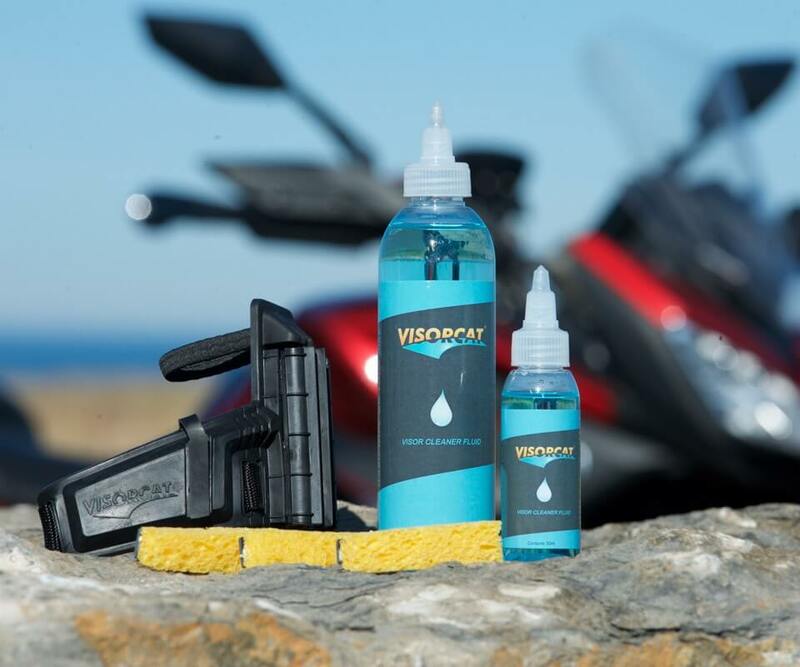 Clear flies, dust and dirt in summer, road spray, salt, in winter and general road grime all year round. 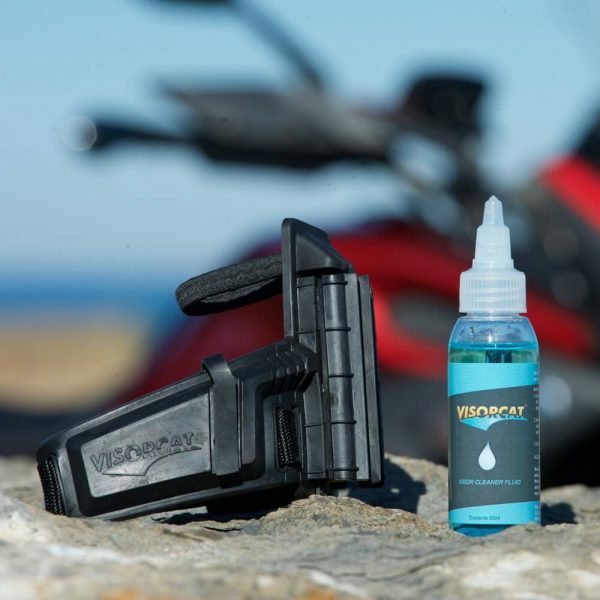 Visorcat, which is made in Britain (assembled in Scotland) comes with a 2-year unlimited mileage warranty. Most UK orders are post free, and gift options are available. See better, ride safer. “The Visorcat is an essential and something I've come to rely on"
“Approved by leading safety agencies, it’s simple and it works." Watch around the world videobiker Bruce Smart (aka Teapotone) expertly filter through London commuter traffic as he reviews Visorcat! 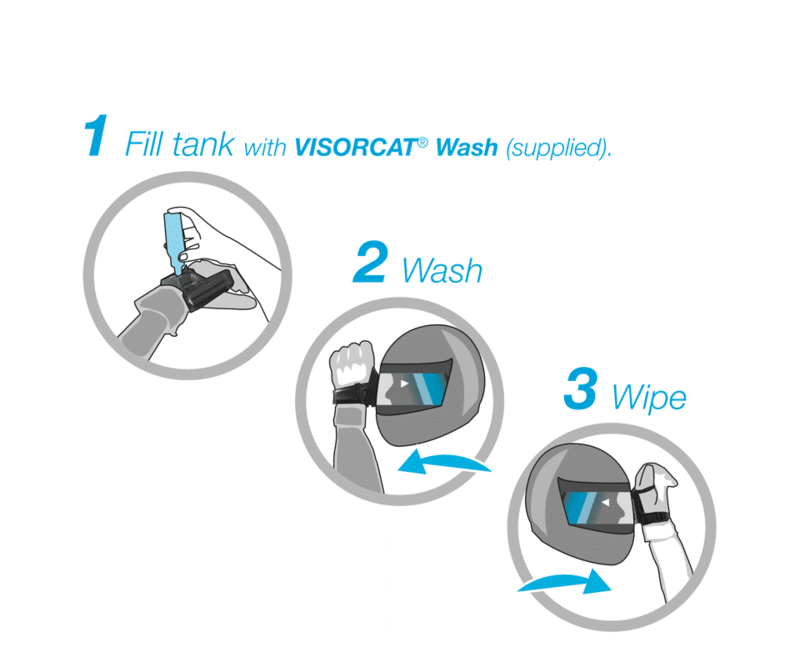 Fill the tank with Visorcat wash, or water. You can top up when you stop for fuel. PATENTED FEATURE! 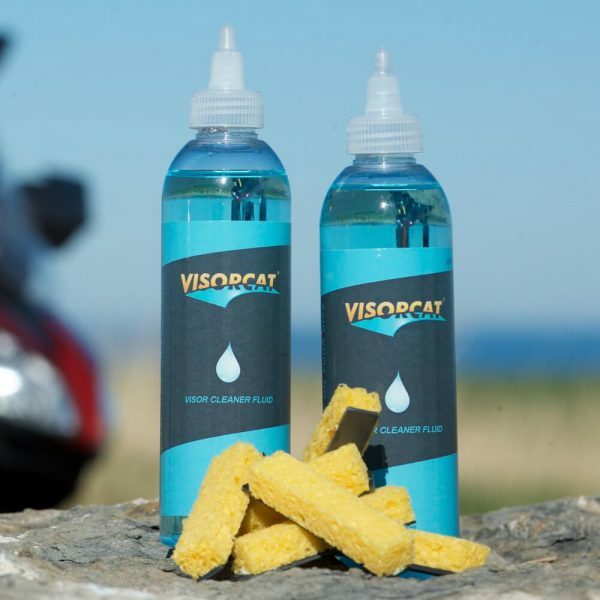 When you move Visorcat across your visor, the curved edge of the sponge guard opens the flap, so you can use the wet sponge. PATENTED FEATURE! 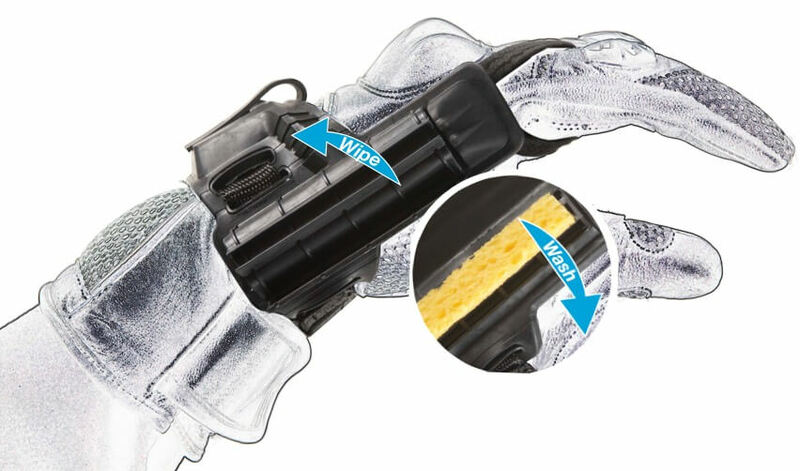 When you wipe the other way, the sponge flap remains closed and the twin wipers can be used to clear the residue. This highly absorbent sponge holds many times its own weight in fluid. 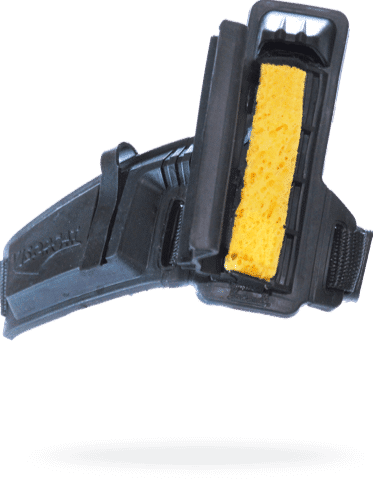 The sponge slides out for rinsing; replacement sponges are available. It's a winner. This elastic digit strap is designed to anchor the Visorcat on your thumb or index finger. The Ladderloc® buckle and strap secures the Visorcat to your glove but it's a second to loosen it if you need to take your glove off and no need to undo the strap completely, so Visorcat can stay on your glove.